You were forced to flee from your home country? You already have a university entrance diploma or even started or finished studying in your home country? We give you the chance to get to know the university through following offers: Language Corner ("Sprachcafé"), Study Field Exploration and a Personal Mentoring Program. If you already have a good knowledge of the German language with a B1 certificate you can apply for the program "International Talents@WH for refugees". In this program you can attend preparatory courses (related to a specific and interdisciplinary field) and a German language course. You get in contact with other new students, learn key soft skills in our coaching and cultural workshops "Fit for Germany" and „Fit for University life“. The program will help you to successfully start at Westfälische Hochschule. 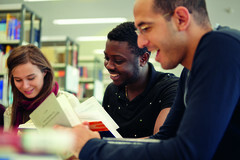 You will get the ideal opportunity to prepare yourself for your life and studies in Germany.